One Saturday morning not too long ago, I woke up, stretched, thought happily about how it was the weekend and I didn't have to go to work, got out of bed, sat down on the futon, opened my laptop, and promptly got sucked into the black-hole-(wo)man-eating-vortex that is the internet. It took less than an hour for the guilt and anxiety to set in. Facebook told me that almost everyone in Minnesota was participating in a 5k run, the blogs I follow told me that all of the bloggers in the world were finishing up all sorts of crafts and projects, and there were endless pictures of people adventuring in other countries, learning new languages, eating strange foods, and standing at the top of mountains/on the edge of cliffs/with their toes in some warm, far-off sea. I was sitting on my futon, staring at my laptop screen. In my pajamas. With no plans to do anything or go anywhere. Why wasn't I outside in the world at that very moment participating in every event and activity possible? How many mind-expanding opportunities was I missing out on? This kind of minor existential crisis is not a rare occurrence for me. I suffer from the above anxieties multiple times a day. I rarely feel like I am doing enough. This sense of failure usually leaves me feeling so overwhelmed and paralyzed by how much I'm not doing that I continue to not do. I wallow, I sit, I fret, I stagnate. Something needs to be done about this problem. Are there a million pictures of completed crafty projects sitting on your DIY Pinterest pinboard, and you have no idea how everyone else managed to get them all done when you can barely even summon the energy to make yourself dinner after you get back from work, much less whip out the glue gun and paint? Do you feel like you are completely uncultured because all of your Facebook friends are currently in different countries, wearing berets and writing status updates in other languages? Do you spend hours jealously clicking through what seems like endless pages and posts of other peoples' amazing photographs of their adventures and outings with beautiful friends in beautiful places? And hey, guess what: you know all of those people who finished those DIY projects, traveled to those other countries, and took those beautiful photos? They are one person too. They, too, can only do so many things in one day; in one life. They are not doing ALL OF THE THINGS. They are doing one thing at a time, just like you. The blogger you pinned who made that coffee table out of wood palates did not also do all of the other DIY projects that are sitting on your pinboard. She, as one person, did that one project. Just like that other blogger, as one person, posted those gorgeous engagement photos, and your Facebook friend, as one person, traveled to Europe and is checking in from somewhere in France. No one person is doing everything, so you shouldn't expect the same of yourself. The Fear Of Missing Out is a real thing. The Busy Trap is a real thing. And the internet only serves to proliferate our feelings of inadequacy. But here's the thing: the internet is not one person. It is billions of people. Billions of people all over the world doing billions of things and then shoving all of those things onto your computer screen and making it look like one person is doing it all. Not all of your Facebook friends are in France. But if you spend enough time online, you can find millions of people who are. And how can you realistically compare yourself to millions and billions of other people? That's right. You can't. 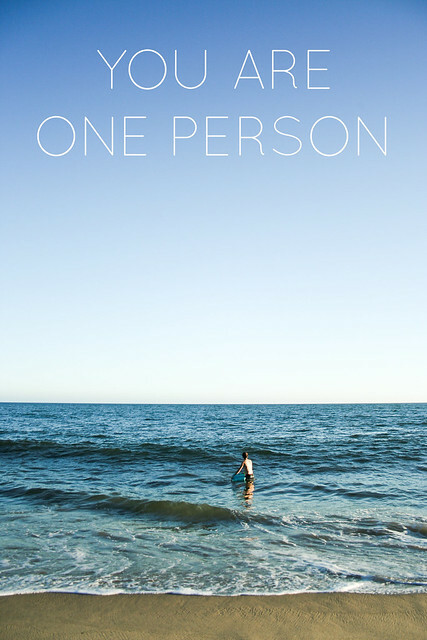 My mantra was originally going to be "you are only one person", but I didn't like the connotation of that phrase. You are not only anything. You might be just one person, but that doesn't mean you are incapable. You still have a say in the matter. You have a world of possibilities open to you, and the beauty of being able to choose (if you can overcome choice paralysis; but that's a whole different topic) the activities that most suit you and your passions. You can do anything, but not everything. No one can. How wonderfully freeing and amazing is that? It's easy to forget all of this, especially if you have lots of time on your hands and choose to use that time to surf the internet. But there's a solution for that, too: don't surf the internet. This past week, I spent much, much less time online than I have in I don't even know how long. It was glorious. I read books. I did laundry. I made plans with friends. I hiked. There were even chunks of time that I was able to live like the internet didn't exist at all; I forgot about it. For me, that is huge. And it gave me lots of extra time to think, and to exist as a single entity, doing my own thing, without feeling compelled to compare myself to anyone else. I was free of the constant bombardment of visual samples of what everyone else in the world was doing, and because of that, I was able to find some peace. I know that staying offline is not totally feasible in this day and age, and I would certainly be unhappy if I completely deprived myself of my favorite blogs and connecting with friends on Facebook. But everything in moderation, dude. And internetting is a lot more fun if you are able to treat it like what it is: an entertaining activity that allows you to interact with people all over the globe. We're pretty lucky that it exists. But it's also easy to feel overwhelmed by it. And so I repeat: the internet is not one person. But you are. So give yourself a motherfucking break.